The best thing you could ever have after an extremely long day at work and an extremely tiring day with your family is the comfort of that nice and warm bed. Our beds are probably our best friend when it comes to comfort. There is no better sleep than a good and comfortable bed to sleep on. You can just imagine the warm comforts of lying on a warm, soft and cozy mattress. We know how bad it can get at work. And we also know how bad things can get when you stay home with your children runs around as if they're just a bunch of newly charged engines. It's excruciatingly exhausting. In times like those do you really wish you could just tuck yourself in on that king bed mattress cover. We totally understand how you feel. Unfortunately, though, it gets especially frustrating when you get on a freezing bed. You need to spend quite a time to warm up before you can comfortably shut your eyes. But, why not give that a simply easy solution? Just get yourself the best heated bed mattress pad. A heated bed mattress cover is the best gift you can probably get for yourself. That way you don't have to curl up and to cover yourself up with jackets and socks just to feel warm in the coldest night. Imagine doing that every single night of winter. Instead of suffocating under thick over thick sheets of blankets, relax yourself with a comfy heated bed mattress cover. We took the liberty of making a list of the best heated mattress pads for you. 60 x 80 x 0.2"
60 x 71 x 1"
Imagine sleeping in a heated mattress cover that's too hot for you. But when you turn the heating own a notch, your husband complains that it's cray cold and turns the notch back up. You're left with the compromise of practically sleeping without the blanket. You don't have to worry about that anymore because the Soft Heat Micro-Plush Mattress Pad has a His and Her Dual Controls. What does that mean? Well, it means that the heated mattress pad has two zones that are heated differently. Isn't that great? You wouldn't have to worry about your husband ever sleeping in that hot spring type of heat while you relax and coze-up to the right temperature you've always wanted. Other than the dual zone, you also have a set timer where you just set how long the mattress stays heated. For that reason, you can just forget about it and not worry about turning it off every time you wake up. Besides, you have other priorities once your eyes pop open every morning. We do! And we call it breakfast! Anyway, you'll love the timer as well as the heat settings. You can easily tone it up or tone it down without much worry of raking up a higher electric bill. The SoftHeat Mattress Pad is a low-voltage mattress pad. It operates less than 25 volts. With that low-heat technology, you're sure to save on electricity. We've also found out that sleeping on a cooler temperature and cozying up on a warm heated mattress promotes better sleep, then turn down your thermostat and turn up the heat on your mattress. That's a great save on electricity every night! We love the fact that the Soft Heat low voltage heated mattress pad also has a small thin wires that you can barely feel under the sheets. The wires also provide equal heating for you and your husband. It's also a gentle heat release that easily eases those tensed up muscles on your back, neck and shoulders. You're guaranteed with a Safe and warm mattress pad with the SoftHeat mattress pad. For all those lovable reasons, we are putting the Soft Heat Micro-plush Top electric warming mattress pad by SoftHeat first on our list. “Sunbeam satisfies every time!” we know it's just a motto for Sunbeam but they really live up to that slogan. We love the Sunbeam premium quilted heated mattress pad because it has 10 heat settings that makes you choose exactly the right heat you'd want your be to have. And with a 10 heat setting, it is also accompanied by a 10-hour automatic shut off to ensure your safety and your family's safety as well. We wouldn't want you house to burn down because of an over-heated bed mattress, do we? Now, that is what we call a 10 for 10! We also love the fact that this best heated mattress pad is made of 100% Polyester. And with pure polyester, Sunbeam also included a softness level for each and every heated mattress that they have. The Sunbeam quilted heated mattress pad has four levels of softness: soft, extra soft, ultra soft and premium soft. Believe us when we tell you that all of them are nice and comfy but when it comes to this heated mattress pad, it falls under the ultra soft level. Moreover, this particular heated bed mattress cover by Sunbeam is quilted with vertical lines. This way, it even hugs your entire body without the mattress fills clogging up on some sides that would, in the long run, become uncomfortable. The quilted polyester heated bed mattress pad has 5 ounces of fill with a 140 thread count. That means that the bed is really really soft without the added lack of proportionate fill. Another plus factor for this bed mattress is that it's machine washable. It's also safe in the dryer so, you wouldn't have to hassle yourself going to the laundry shop or the dry cleaners just for one piece of mattress cover. You can easily just toss the bedding into the washing machine! Easy, right? Well, we sure you would also love the fact that it's not just machine safe but also very flexible. It can cover up to 18 inches of mattress. See? No matter how thick your mattress is, we can just as easily fill it in with the soft padding the Sunbeam premium quilted heated mattress pad can offer. No matter how great this heated mattress is, the lack of dual control zones places it second to our list. With a heat setting that give you 10 different levels of heat will is probably the best asset for this heated mattress pad. We really love this because the different heat settings provide for the best back relief. If you're experiencing back pains from awkwardly sitting down the whole day in the office or experience shoulder and upper arm cramps because of the hard work you've been doing, then it's best to settle with Electrowarmth. The different warmth settings provide a therapeutic appeal that helps in reducing tensions, aches and cramps. This heated bed mattress cover has equal distribution that does not cut you short because it reaches all the way to the end of the mattress pad. You have the luxury of enjoying warmth all the way to your feet, especially of you are a person whose feet reaches to the edge of the bed. Or rather you're the adventurous type of sleeper where every single corner of the bed gets to enjoy your weight. We also love the fact that it also comes with a queen size heated mattress pad dual control setting. It can heat up the two sides of the bed for you and your husband. That way, you wouldn't have to sacrifice each others comfort for yours. Your husband can enjoy that crazy heat that makes you sweat while you enjoy just that gentle warmth behind your back. This safe and warm heated mattress comes with a great controller. The screen display is big enough to see the control setting. The buttons also gently light up at night so you can simply adjust the what without having to fish out the controller through the dark and change the settings. Although some Electrowarmth electric pad reviews did suggest a concurrent issue with the controller, we haven't so far experienced it. Another plus factor for this heated bed mattress pad is that it heats up in just 5 minutes. This is a fast relief comfort because other heated mattress pads need about 15 minutes to heat up. For the reason that it may have controller issues, we are putting it in the safe middle of our list. Whenever we hear of the word waterproof, we always relate it to rubber or plastic. But that's not the case with Serta Heated Mattress Pad, it is a heated mattress cover that can be washed in the washing machine and dried in the dryer. Advanced comfort where you get to lay on a cloud of comfort is exactly what Serta aims to offer. They give you that gentle heating comfort or probably the steaming warmth you'd love to coop up on during the coldest of night in winter. Everything comes with the heat settings that can generate as much or as little heat just the way you like it. We also love this because it is also a dual control heated mattress pad. For the likelihood of you not wanting the way your husband set his heat, you can have your own control of how much warmer you'd like your bed to be. We also love it so much because aside from the king heated mattress pad dual controls it is also the perfect fit low voltage warming mattress pad. It's great how much this heated mattress helps you in saving electricity. It's also a plus factor that it doesn't require a long preheat option. You can simply turn on the settings and wait for as short as five minutes for it to get warm. It's also a bit thicker than most of the mattress pads we have on our list that's why you can barely feel the bulky wires under the heated bed mattress cover. This mattress pad is full of fluff that all you can only feel is the warm, sweet soft comfort of your bed. For so many reasons to love this mattress, it does come with a small problem. It is really heavy. Even if you can wash this in the washing machine, it takes up quite an amount of laundry detergent and quite a longer period in the machine than you would anticipate. For this sad reason, we are placing it fourth in our list. 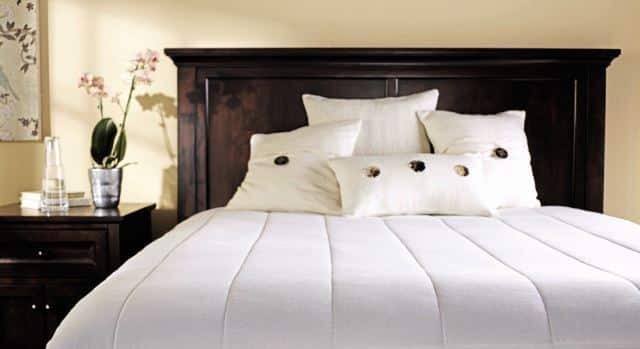 The things we love about this as one of our best heated mattress pad start with the fact that it is supremely comfortable because it is the only heated mattress pad in our list that is made of Sherpa polyester fabric. It gives your that nice and luxurious feel. It's soft without being too overbearing. It also comes in two wonderful colors: white and gray. One other reason why we love it so much is because it also has the dual control heating for him and her. That way, you're assured of both comforts without sacrificing each other's preference. What we also love about this blanket is that it uses a digital controller. Most of our heated mattress covers in our list are using analog buttons but this Biddeford heated Sherpa mattress pad doesn't. The digital screen provides an easy access to the 10 heat settings. The ten heat settings are adored by most heated mattress pad owners because the Biddeford Mattress Pads really touches the levels up a notch other mattresses come with heat settings that are very close to each other to the heat settings end up being just gently warmer than the last number. But for Biddeford, you can feel the difference just one number up the other. Even if it is using a Sherpa top, it doesn't sacrifice the ability of the wiring to heat the mattress without delay. The bulky wiring gets drowned under the soft top. And honestly, it really does feel much better to sleep on this mattress. It has a plus comfort and plus benefit because it can hug mattresses that are 22 inches thick. However, no matter how much we love this heated bed mattress cover, we really can't let the weight of this mattress pass. It's simply too heavy. And even if the Sherpa top is a plus factor, it can also be its demon because it is a magnet for lint and dirt. For these markdowns, we are putting this at number five. We love our beds and every time we upgrade it, we are giving ourselves a long-term well-deserving gift. We have outlined the top Best Heated Bed Mattress Pads to give you an idea of just what are the best among a pool of heated mattresses in the market. Do not get yourself fooled with cheaper bed mattresses because they have been proven to be a fire hazard. We wouldn't want that on your bed, do we? Our round-up is simply a great list and we would only give you the best.